Frequently Asked Questions about the Big Boss 1300-Watt Oil-Less Fryer. The Big Boss is big – its dimensions are 16” X 13.5” X 12” and it weighs in at 14.7 lbs. It has been designed to cook two meals or two types of food at once, so there are two trays. The cooking controls are placed on a large dial on top of the lid, so they are easy to see and read. The cooking pot is shaped like a large casserole pot with large black handles on either side of the glass bowl. A set of tongs, an oil sprayer and a recipe book are included. 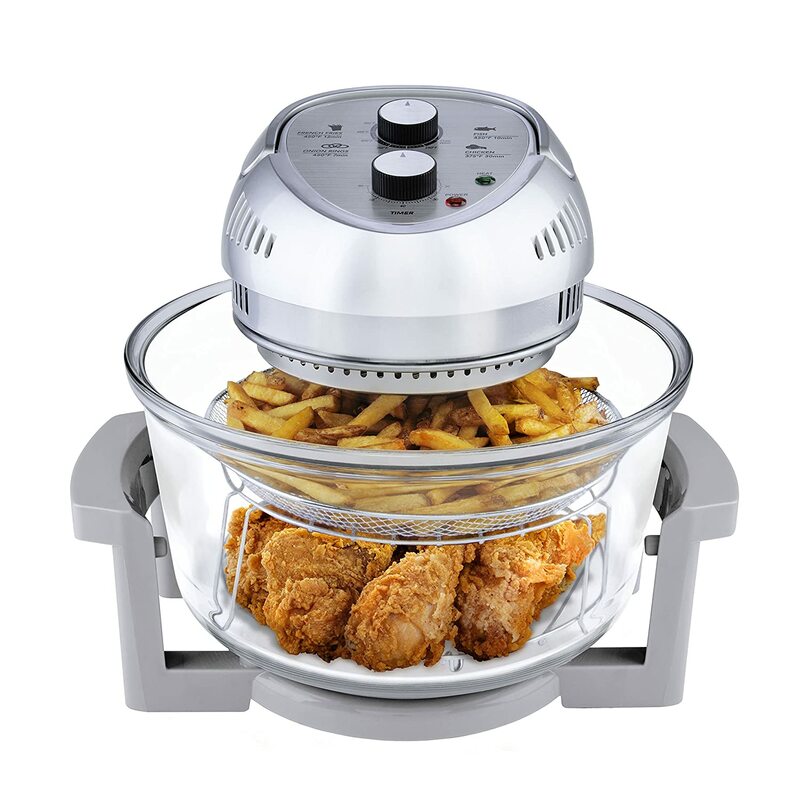 The Big Boss Oil-Less Fryer cooks a meal from when the food is still frozen to the point where it is crispy on the outside and tender on the inside, without a need for prior thawing or defrosting. The three sources of power work in unison as Halogen browns the food’s surface, convection circulates the heated air for a speedier cooking time and infra-red cooks the inside of the food and seals in the juices. All of this can be done on a tabletop in a short amount of time. You can watch the food cooking as you prepare a variety of dishes from meatballs, meatloaf, chicken, steak, French fries and a roast dinner to roast vegetables with herbs. You can cook a whole chicken in the Big Boss and with the metal extension ring you can even cook a whole turkey. This fryer uses up less electrical power because of the other sources of power that it makes use of. It only takes seven minutes to cook perfect onion rings in this oil-less appliance. 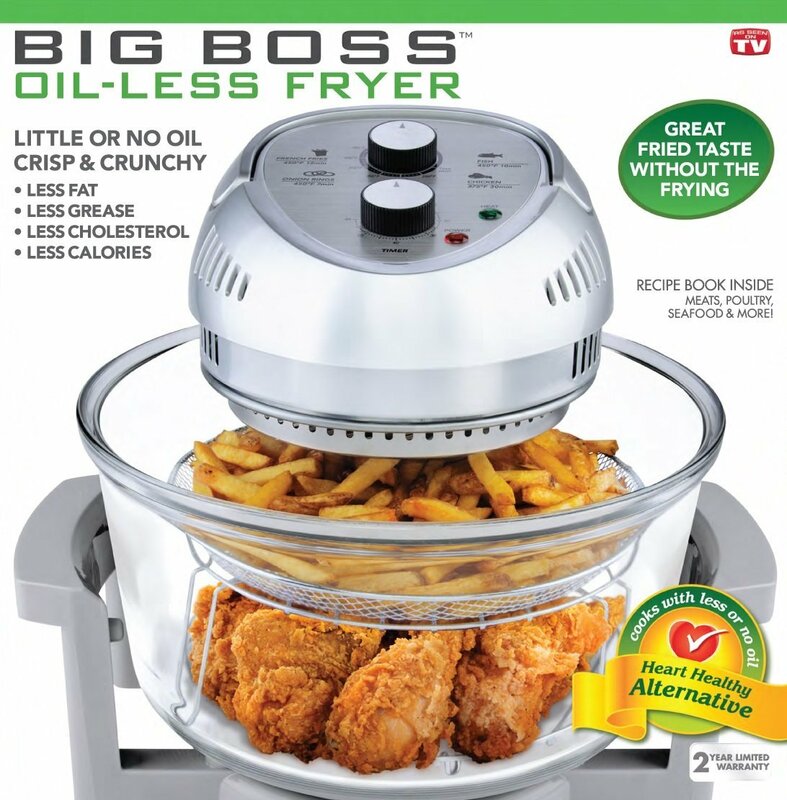 All of the meals cooked in the Big Boss Oil-Less Fryer are healthy for the heart as well as the arteries and saturated fat levels are low to non-existent. Baked Apples, small- sized pizzas and popcorn can also be cooked in the Big Boss. The food it cooks is healthier than food cooked by average frying processes. The Big Boss cooks faster than the oven. You can place it on the table to watch the food while it cooks. You can dehydrate food using the Big Boss appliance. 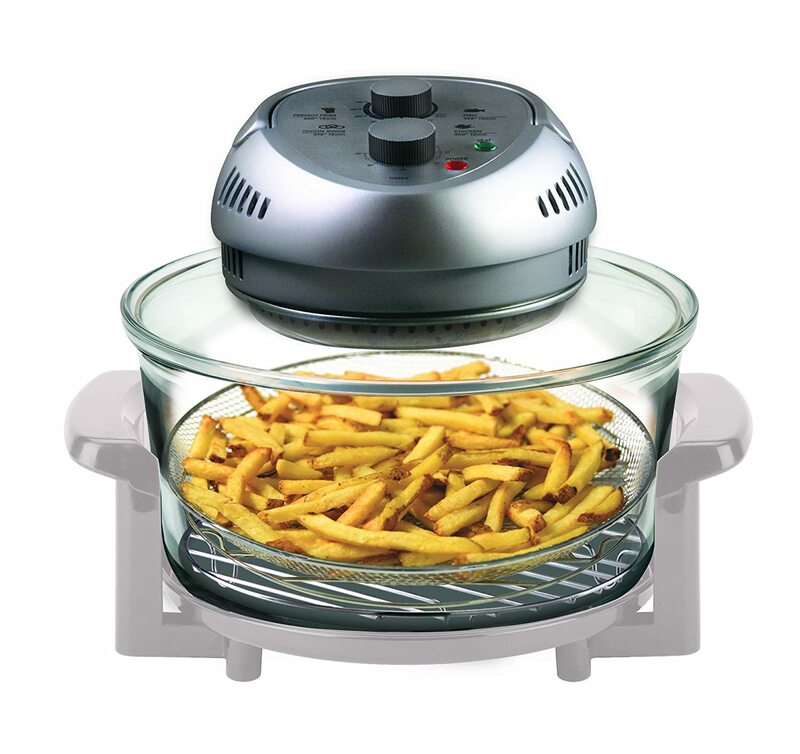 It’s possible to cook a meal such as steak and veggies all at once in the Big Boss Oil-Less Fryer. The appliance is hefty and it takes up too much space in the kitchen. It can’t cook meals for more than two or three people at a time. The food does not taste as delicious as traditionally fried food. 1. What is the basket made of? Answer: The basket and racks are made of chromed steel. 2. How do you clean up this appliance? Is it dishwasher safe? Answer: The racks get cleaner if you wash them by hand and as for the big glass bowl… I wash that by hand, too. 3. What does this do to your power bill? Answer: I use it several times a week and I have not noticed any increase in my power bill. I think it uses about the same amount of power as a microwave oven. 4. Has anyone tried jumbo shrimp? Answer: Yes, I’ve made regular Tiger and Jumbo shrimp, Cajun style. It’s cooked to perfection! It comes out tender, plump and juicy. 5. Does anyone know of concerns using Halogen and infra-red in cooking; changes in the food other than being cooked? What are they? Answer: The Halogen light is very bright and the infra-red heat tended to dry out the food. I tried a number of foods at different temps and still found that to be true.